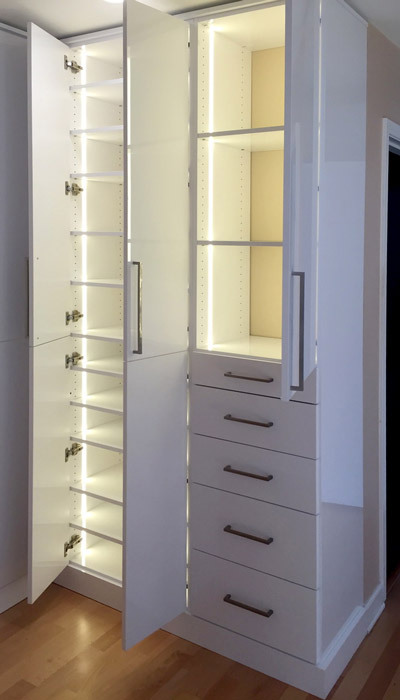 Under-shelf, horizontal LED strip lighting was incorporated above the closet rods, illuminating the entire wardrobe and making it easy to find clothing. Vertical recessed LED strip lighting was used along the sides of the shelves for a dramatic, but practical solution to illuminate the contents of this dark corner. Like a beacon in the night, this custom wardrobe closet offers more than supreme organization. 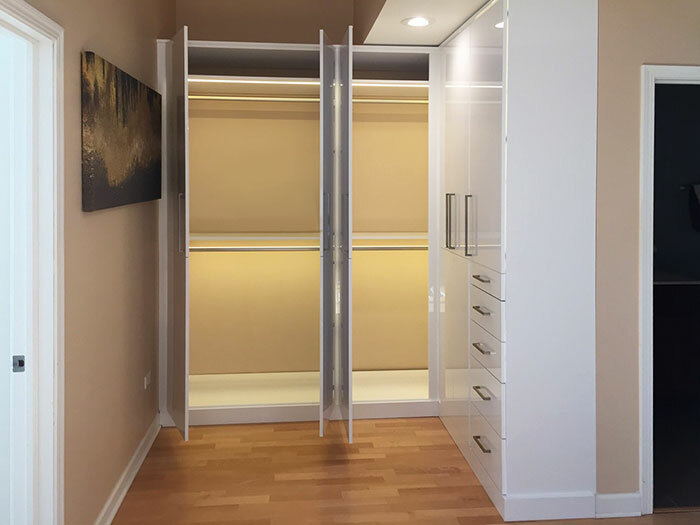 In addition to tripling the amount of available storage in the room, this organization system transformed under used, wasted space into a custom, L-shaped, wardrobe style closet that meets all of the homeowner's storage needs. The unit features closet lighting solutions that add both functionality and pizazz to an odd-shaped, previously overlooked corner of the room. The high gloss white laminate finish with flat door and drawer fronts creates a modern aesthetic. Like a perl next to a flame, the glossy surface reflects the light from the custom wardrobe lighting, enhancing the overall glowing effect of these contemporary wall closets.